The image below illustrates active stretching of the ITB. This illustration demonstrates active stretching of the iliotibial band (ITB). The athlete stands a comfortable distance from a wall and, with the contralateral knee extended, leans the proximal shoulder against the wall to stretch the ipsilateral ITB. For patient education resources, see the Osteoporosis Center. Also, see patient education articles Knee Pain, Knee Injury, Tendinitis, and Running. See also Medscape Drugs & Diseases articles Iliotibial Band Friction Syndrome and Physical Medicine and Rehabilitation for Iliotibial Band Syndrome. See also the Medscape CME & Education topic Medical Interventions Effectively Treat Overuse Injuries in Adult Endurance Athletes. ITBS is the most common cause of lateral knee pain in runners. Although few studies are available regarding the incidence of ITBS in athletes, some studies cite this condition with an incidence as high as 12% of all running-related injuries. Several studies of US Marine Corps recruits undergoing basic training determined the incidence of ITBS among this group to vary from 5.3 to 22.2%. Data are not available regarding the international incidence of ITBS. The ITB is not attached to bone as it courses between the Gerdy tubercle and the lateral femoral epicondyle. This lack of attachment allows it to move anteriorly and posteriorly with knee flexion and extension. Some authors hypothesize that this movement may cause the ITB to rub against the lateral femoral condyle, causing inflammation. Other investigators hypothesize that injury of the ITB results from compression of the band against a layer of innervated fat between the ITB and epicondyle. Furthermore, a potential deep space is located under the ITB as it crosses the lateral femoral epicondyle and travels to the Gerdy tubercle. This bursa may become inflamed and cause a clicking sensation as the knee flexes and extends. The inflamed bursa may add another component to ITB tendinitis. See also Medscape Drugs & Diseases topics Bursitis and Tendonitis. In cyclists, the ITB is pulled anteriorly on the pedaling downstroke and posteriorly on the upstroke. The ITB is predisposed to friction, irritation, and microtrauma during this repetitive movement because its posterior fibers adhere closely to the lateral femoral epicondyle. Ellis R, Hing W, Reid D. Iliotibial band friction syndrome--a systematic review. Man Ther. 2007 Aug. 12(3):200-8. [Medline]. Fairclough J, Hayashi K, Toumi H, et al. The functional anatomy of the iliotibial band during flexion and extension of the knee: implications for understanding iliotibial band syndrome. J Anat. 2006 Mar. 208(3):309-16. [Medline]. Fredericson M, Wolf C. Iliotibial band syndrome in runners: innovations in treatment. Sports Med. 2005. 35(5):451-9. [Medline]. Beynnon BD Johnson RJ, Coughlin KM. Knee. DeLee JC, Drez D Jr, Miller MD, eds. DeLee and Drez's Orthopaedic Sports Medicine. 2nd ed. Philadelphia, Pa: Saunders; 2003. 1871-2. Akuthota V, Stilp SK, Lento P. Iliotibial band syndrome. Frontera WR, Silver JK, eds. Essentials of Physical Medicine and Rehabilitation. Philadelphia, Pa: Hanley & Belfus; 2002. 328-33. Harris M, Williams CW, Stanish W, Micheli LJ, eds. Oxford Textbook of Sports Medicine. Oxford, England: Oxford University Press; 1994. Messier SP, Edwards DG, Martin DF, et al. Etiology of iliotibial band friction syndrome in distance runners. Med Sci Sports Exerc. 1995 Jul. 27(7):951-60. [Medline]. Lindenberg G, Pinshaw R, Noakes TD. Iliotibial band friction syndrome in runners. Phys Sports Med. 1984. 12(5):118-130.
van der Worp MP, van der Horst N, de Wijer A, Backx FJ, Nijhuis-van der Sanden MW. Iliotibial band syndrome in runners: a systematic review. Sports Med. 2012 Nov 1. 42(11):969-92. [Medline]. Richards DP, Alan Barber F, Troop RL. Iliotibial band Z-lengthening. Arthroscopy. 2003 Mar. 19(3):326-9. [Medline]. Baker RL, Souza RB, Rauh MJ, Fredericson M, Rosenthal MD. Differences in Knee and Hip Adduction and Hip Muscle Activation in Runners With and Without Iliotibial Band Syndrome. PM R. 2018 Apr 26. [Medline]. Baker RL, Fredericson M. Iliotibial Band Syndrome in Runners: Biomechanical Implications and Exercise Interventions. Phys Med Rehabil Clin N Am. 2016 Feb. 27 (1):53-77. [Medline]. Foch E, Milner CE. Frontal Plane Running Biomechanics in Female Runners with Previous Iliotibial Band Syndrome. J Appl Biomech. 2013 May 13. [Medline]. Meardon SA, Campbell S, Derrick TR. Step width alters iliotibial band strain during running. Sports Biomech. 2012 Nov. 11(4):464-72. [Medline]. Noehren B, Schmitz A, Hempel R, Westlake C, Black W. Assessment of strength, flexibility, and running mechanics in men with iliotibial band syndrome. J Orthop Sports Phys Ther. 2014 Mar. 44 (3):217-22. [Medline]. [Full Text]. Shamus J, Shamus E. THE MANAGEMENT OF ILIOTIBIAL BAND SYNDROME WITH A MULTIFACETED APPROACH: A DOUBLE CASE REPORT. Int J Sports Phys Ther. 2015 Jun. 10 (3):378-90. [Medline]. [Full Text]. Gunter P, Schwellnus MP. Local corticosteroid injection in iliotibial band friction syndrome in runners: a randomised controlled trial. Br J Sports Med. 2004 Jun. 38(3):269-72; discussion 272. [Medline]. Cardone DA, Tallia AF. Diagnostic and therapeutic injection of the hip and knee. Am Fam Physician. 2003 May 15. 67(10):2147-52. [Medline]. [Full Text]. Allen DJ. Treatment of distal iliotibial band syndrome in a long distance runner with gait re-training emphasizing step rate manipulation. Int J Sports Phys Ther. 2014 Apr. 9 (2):222-31. [Medline]. [Full Text]. Henderson JM. Therapeutic drugs. What to avoid with athletes. Clin Sports Med. 1998 Apr. 17(2):229-43. [Medline]. 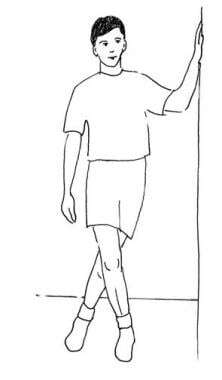 This illustration demonstrates iliotibial band syndrome stretching that is performed in a side-lying position.